My JKD journey began one sleepy afternoon in July 18 months ago. I had completed 5 years of working, and had finally seen the end of my student debts. Yet, I felt like I was just existing, and letting life push me around. The weekdays seemed like a chore, I was constantly bored and tired. The weekends seemed like Manna, but when they did arrive, they left in a tearing hurry, and I was back to work on Monday asking myself where the time went, and questioning the way I spent it. Every time I reflected on my life, it seemed like I had lost the spirit and energy with which I had started it. My work was supposed to be a matter of choice and personal fulfillment, right? So why did I feel like I was trapped in a morass? Why did I feel like life had taken over me? Like I didn’t know who I had become? When I had imagined my future in college, I was supposed to have become a better person – I was to have lost weight, become more confident, become surer of myself, and only do things I wanted to do. Yet, here I was, the anathema of what my youthful self wanted to be, with no way out. ‘Enough is Enough!’ , I thought to myself. “I’ve spent 5 years existing and paying off debts”. “Its time I spent some energy and time on myself”. So I sat down with a mental list of things I wanted to do with myself. I looked at my list, and decided to tackle the most obvious things first. I wanted a great body. I was sick off my apologies to myself whenever I looked at myself. I was sick of mentally discounting any compliments I received. I was sick of my inability to stick to a diet or a gym. I had poured thousands of rupees down the drain by enrolling for diets and exercise programmes and not sticking to them. I was sick of the remarks my well-meaning relatives made whenever they met me. I was sick of being around my handsome husband and being the ‘ugly one’. I felt sure anyone who met us as a couple was secretly commiserating with my husband. I told myself I had tried everything – diets, walks, gyms, nothing seemed to work. Maybe I had an incurable disease? An endocrinal problem? My lack of confidence in myself had built up into a monstrous disease. I had become a clingy, whiny person looking for affirmation. My impossible demands from my husband led us to terrible fights where I would lash out with every weapon at my disposal – tears, arguments, sulks, threats. Nothing he said to me made a difference. I was rapidly becoming a cynic, who discounted his compliments, protestations of love, and well-meaning gestures, constantly looking for signs of fatigue from his end. So here I was, one desultory afternoon. I had had one of my bursts of energy, and I told myself, I was going to wholeheartedly try something new. 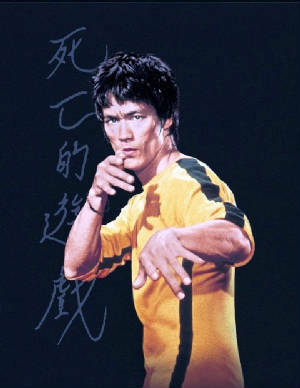 My husband had been reading this new bock, which was an autobiography of Bruce Lee. My childhood resurfaced……..
An endless cycle of seeking peace and security, of wanting something I thought I couldn’t give myself…. This had to stop. I had to become a strong person. I would not spend the rest of my life depending on another person to give me strength. I would not spend the rest of my life getting another person to convince me that I deserved happiness. Google to the rescue! I was sure I wouldn’t find anyone teaching Jeet Kune Do in India. I decided I was going to google and then join my neighbourhood gym – maybe this time my burst of energy would last longer?? What’s this I see? JKD? Being taught in Mumbai? 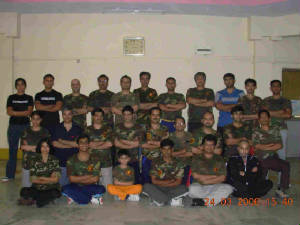 At JKD Ideology Academy, teaching JKD in India & Asia, At convenient timings? Probably a fly-by-night operator… I dialed the number rather nervously, dreading and hoping simultaneously that no one would pick up the phone. Ok, someone did pick up the phone, and asked me to come by to see them. It was the next Sunday..I told my husband, who was instantly enthusisastic about joining as well. We set off to andheri to JKDI Academy, as the voice on the phone described the place, and walked in…. “Of course, just after you spar for just 5 minutes”..
Why? Why did I have to join this class? Why can’t people leave me alone? Why must I be beaten up again and again and again? Wasn’t the time when I was 15 enough for the universe? But yet, in every small victory, in every large defeat, in every tear I shed, my teacher was with me…. And the mould started to break…. “I have no determination”..”I have some determination”..
“I am a cog in the wheel…” “I choose the wheel, and choose to be a cog”..
To be who I want to be..
To be proud of who I am..
To laugh and cry without shame.. I feel like I’ve walked out of prison..
A prison that was lovingly created by me..
JKD is not a physical art. When I punch my opponent, I punch my doubting self. When I kick the bag, I kick away my fears. When I receive a blow, I build my strength. When I execute a perfect front kick after 20 bad kicks, I demonstrate my persistence. When I look at the bruise on my foot that I’ve got after practicing repeated hook kicks on the bag, It is my medal of honour. For in being adaptable like water, I have learned strength to overcome any circumstance. In being direct, I have earned respect from the people around me…I am learning to be proud, and hold my head high without fear.. I have learned to be at peace..not to struggle, to give in gracefully, to be happy, to be cmposed, to be calm.. I have learned discipline…that effort and persistence can move mountains…especially in my head!